This season, the men's swimming and diving team won the Ivy League for the 25th time in program history. When you’ve been winning for 88 years, it’s hard to make a season stand out. As problems go, it’s a good one to have, but it’s the problem that the Harvard men’s swimming and diving team faced at the beginning of the 2017-2018 campaign. The Crimson has never finished with a losing season since it began competing in 1930, and the last and only time that the program failed to cross the .500 mark was 1971, when Harvard completed the year at 5-5. Over the same period, the Crimson has amassed 19 undefeated campaigns. Needless to say, this year’s Harvard squad needed to come up with something extraordinary to make the season memorable. In the end, it more than managed. En route to finishing the season undefeated for a 20th time and picking up a 25th Ivy League title, the Crimson had a year marked by breakout performances, incredible showings from established contributors, and revenge for the team’s veterans. All three elements were on full display as Harvard cruised to the Ancient Eight title at the Ivy League Championship Meet. The contest had special significance for the team’s older members, who lost to Princeton by a mere 21.5 points at the same bout in 2016. The Crimson was denied a chance to even the score last season, with the Tigers barred from competition, although they did take back the Ancient Eight championship. This time around, with the opportunity to beat out its fierce rivals directly and erase the memory of two years ago, Harvard made sure to capitalize. "I think everyone can agree on this team that our success was in large part due to [the seniors'] leadership," sophomore Daniel Chang said. On the back of a solid team-wide effort and standout performances from several of its athletes, the Crimson eclipsed Princeton and the rest of the league, finishing with 1650.5 points. The Tigers ended the meet with 1285.5. Junior Brennan Novak and sophomore Dean Farris played a crucial role in securing the victory, with the duo’s efforts earning them a joint share of the Phil Moriarty Award, given to the high-point swimmer for the meet. The pair set five new Ivy League Championship and Harvard records between them, winning every event they competed in and contributing to 10 victories. Farris smashed the previous-best times in the 200-yard freestyle, 100 backstroke, and 200 backstroke, while Novak cleaned up in the distance events, finishing with record marks in the 500 and 1000 freestyle races. Farris’ time in the 200 free was the fastest in the nation at the time, earning the sophomore an NCAA A-cut designation and the top seed at the national championships. Two Crimson seniors added A-cut performances of their own on the boards, with co-captain Bobby Ross and senior David Pfeifer finishing fourth and sixth, respectively. The pair’s success was reflective of the leadership that the team’s upperclassmen provided not only during the Ivy League meet but throughout the season. The benefit of the collective experience of the Crimson’s seniors and other veteran members was demonstrated in the first few meets of the season. The team opened the campaign with decisive victories over Dartmouth, Cornell, and Columbia, winning each the three contests by an average of 127 points. That margin was greater than the points totals of any of Harvard’s first three opponents. The team’s experienced members were crucial to the early season wins. Novak and fellow senior Ed Kim each picked up two solo victories against Dartmouth and Cornell, while Farris won the 100-yard backstroke and Ross and Pfeifer took the one-meter and three-meter dives, respectively. Farris, Houck, and Novak led the team once again against Columbia, with the former two setting a trio of pool records between them. 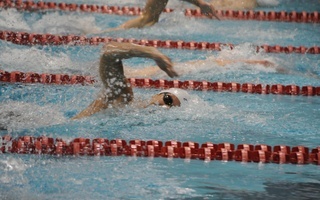 Farris, Kim, and seniors Steven Tan and Paul O’Hara also combined to set a new pool-best mark in the 200 freestyle relay. The Crimson faced its first true test of the season in then-No. 10 Arizona State. While Harvard’s experience was once again decisive, strong performances from some of the team’s newer members helped the Crimson edge out the Sun Devils, 155-143. Novak, Kim, and Tan all had strong showings, with Tan contributing two solo wins and a pair of relay victories, but the team’s veteran corps had help from a pair of less-experienced athletes in Chang and freshman Michael Zarian. Chang topped his previous personal best for the season in the 200-yard breaststroke to touch the wall first, while Zarian picked up a gold medal result in the 200-yard butterfly. Both finishes added crucial points to help Harvard knock off a top-10 team and send a message on the national level. The Crimson cruised through the remainder of the regular season thanks to consistently strong performances across the team. Wins for Houck, Chang, Farris, and Ross helped steer Harvard past Penn, while Farris, Novak, Ross, and sophomore Raphael Marcoux each picked up solo victories against Bryant and Rider to secure a pair of positive results. The team’s final contest of the season had higher stakes, with the Crimson facing off against archrivals Princeton and Yale for the conference dual meet championship. Harvard wasn’t fazed by the pressure, though, and the Crimson swept past both opponents by more than 100 points each to secure a second consecutive Ancient Eight regular season title in its home pool. The meet featured a bevy of standout swims, highlighted by a trio of solo victories for Farris and a new Blodgett Pool record for Novak in the 500 free. On the boards, Pfeifer dominated, achieving first in the three-meter dive. Harvard carried that momentum through its outright Ivy League title at the conference meet and into the NCAA championships in March. Ranked 24th in the country heading into the contest, the Crimson bested its seed to finish 18th in the nation. Farris once again led the way, garnering six All-America honors and breaking program records in the 50-yard freestyle and the 800 free relay. The Atlanta, Ga., native also raced to a sixth-place finish in the 200 free, touching the wall behind two Olympic gold medalists and a World Championships gold medalist. Farris added to his award total with a seventh-place result in the 200 backstroke, also good for first team All-America. Novak and Houck also chipped in considerable points, racking up three honorable mention All-America honors between them. O’Hara, Tan, Marcoux, sophomore Zach Snyder, and freshman Mahlon Reihman picked up honorable mention All-America awards as well for their efforts in the relay events. With the 18th-place finish, Harvard outpaced several highly-ranked teams in the overall standings, including No. 8 Arizona State, No. 13 Missouri, and No. 19 Notre Dame. The result sees the Crimson take one more step towards realizing its goal of becoming a national powerhouse program. Overall, even against the backdrop of nearly 90 years of success, this season stood out for the Crimson. The team captured a second consecutive regular season title, finished undefeated for the third time in four years, and reclaimed the Ivy League championship from bitter rival Princeton. Harvard also used the momentum of a victory over top-10 opponent ASU to make a mark on the national stage, finishing inside the top-20 at NCAAs. While the leadership of the team’s seniors will be missed, breakout performances from a handful of new faces and strong showings from established returners will leave the team confident heading into the coming season. With that in mind, and despite all the successes of the 2017-2018 campaign, the Crimson is already looking ahead to next season. —Staff writer Sam O. M. Christenfeld can be reached at sam.christenfeld@thecrimson.com. ​The Harvard men’s swimming and diving team’s meet against Yale was supposed to be a competitive affair—a matchup between the two remaining undefeated programs in the Ivy League, featuring some of the conference’s top swimmers. In the end, though, the contest looked more like just another practice for the Crimson.